Peer review is the central mechanism to verify the quality of scientific manuscripts. According to the internet platform SciRev, peer review processes are often lengthy, which delays the distribution of valuable, novel knowledge within the scientific community. To streamline this phase in scientfic knowledge dissemination, SciRev aims to increase transparency of scientific review processes across journals. Therefore, researchers are invited to evaluate their review experience with a journal based on various characteristics, such as duration of review rounds or rejection time or overall satisfaction with the review process. The information provided is aggregated into scores, which feed into a comprehensive database, so that journals become comparable. Ultimately, researchers can search for journals with an efficient peer review procedure and benefit from timely publication while journal editors have the opportunity to compare their journal’s performance with that of others. Check out the website to contribute to the database or benefit from your peers’ journal review experiences. This entry was posted in uncategorized and tagged journals, peer review, publication, science communication on 10. February 2017 by Jessica Petersen. Together with other selected contributions from the last workshop higher education management, the German journal “Hochschulmanagement” (higher education management) published our paper “Open post-publication-peer-review: an alternative to double-blind reviews in academic journals?”. The study contributes to the discussion about alternative forms of scientific communication by evaluating the actual dissemination as well as the potential use of open post-publication-peer-review (OPR). The study is based on survey data with a sample of 2.800 authors of academic papers. Results show that only one third of respondents believe that OPR is useful for enhancing the operative reliability of review processes. The advantages of OPR discussed in the literature are only relevant for the general willingness of authors to publish with OPR in principal. However, when it comes to actual publication decisions (open vs. blind peer review), these potential advantages are only of minor importance for the selection of an appropriate journal (with the exception of heterodox research which indeed seems to benefit from OPR). Instead, the choice between the different channels of scientific communication is based on institutionalized aspects (legitimacy, quality, design of the systems) and behavioral considerations (expected negative group dynamics and increased workload of OPR). Within the limitations of our dataset, we conclude that the current potential of OPR to solve the problems of traditional double-blind proesses is limited. Bögner, I. & Hattke, F. (2016): Open Post-Publication-Peer-Review: Eine Alternative zur doppelt-blinden Begutachtung in Fachzeitschriften? In: HM – Hochschulmanagement 11(3), 69-74. This entry was posted in uncategorized and tagged peer review, publication, research, science communication on 24. November 2016 by Fabian Hattke. Governing universities is a multi-level as well as a highly paradoxical endeavor. The featured studies in this book examine critically the multifaceted repercussions of changing governance logics and how contradictory demands for scholarly peer control, market responsiveness, public policy control, and democratization create governance paradoxes. While a large body of academic literature has been focusing on the external governance of universities, this book shifts the focus on organizations’ internal characteristics, thus contributing to a deeper understanding of the changing governance in universities. The book follows exigent calls for getting back to the heart of organization theory when studying organizational change and turns attention to strategies, structures, and control mechanisms as distinctive but interrelated elements of organizational designs. We take a multi-level approach to explore how universities develop strategies in order to cope with changes in their institutional environment (macro level), how universities implement these strategies in their structures and processes (meso level), and how universities design mechanisms to control the behavior of their members (micro level). As universities are highly complex knowledge-based organizations, their modus operandi, i.e. governing strategies, structures, and controls, needs to be responsive to the multiplicity of demands coming from both inside and outside the organization. Volume 47 of Springer’s Higher Education Dynamics Series advances higher education research by gathering distinguished scholars with an academic background in management and organization studies and a research interest in the dynamics of university governance. Among them are JC Spender, Mats Alvesson, Alfred Kieser, and many more. Follow these links to find the full table of contents, to order the book or to access single chapters. This entry was posted in uncategorized and tagged publication, research, university governance on 11. June 2016 by Fabian Hattke. Jetta Frost, Markus Reihlen , Ferdinand Wenzlaff and I just published our book on multi-level governance in universities. It summarizes the main results from our project “RePort” which ended in late 2014. In the book, we analyze how external governance of science determines internal coordination mechanisms. For that purpose, we detail university governance on a macro (strategies to cope with the institutional environment), a meso (structures and processes), and a micro level of analysis (behavior control). The book is in German and published by the Kölner Wissenschaftsverlag. You can order it here. Since the threefold framework (macro-meso-micro) proved to be very useful, we are also working on an edited volume in English using the same structure. This entry was posted in uncategorized and tagged publication, research, university governance on 14. October 2015 by Fabian Hattke. Alfred Kieser, Alexander Nicolai, and David Seidl develop a re search program to investigate how the results of scientific research are utilized in management practice. Forthcoming as “The Practical Relevance of Management Research. Turning the Debate on Relevance into a Rigorous Scientific Research Program” in The Academy of Management Annals. Bernadette Bullinger, Alfred Kieser, and Simone Schiller-Merkens find rigour and relevance to be embedded in competing institutional logics. Their forthcoming article “Coping with Institutional Complexity: Responses of Management Scholars to Competing Logics in the Field of Management Studies” will be published in the Scandinavian Journal of Management. 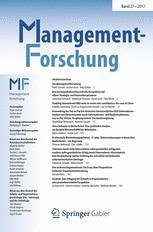 Following upper echelon theory, Steffen Blaschke and Fabian Hattke analyze how diversity of top management teams in universities relates to improved performance in terms of academic reputation and grant acquisition. The article “Striving for Excellence: The Role of Top Management Team Diversity in Universities” is forthcoming in a special issue of Team Performance Management. This entry was posted in uncategorized and tagged publication, research on 5. March 2015 by Fabian Hattke. Based on the annual EFMD meetings on higher education studies, Andrew Pettigrew, Eric Cornuel, and Ulrich Hommel issued an edited volume on “The Institutional Development of Business Schools” at OUP. The book features a chapter of our work on governing logics in universities, in which we assess organizational change from a communication constitutes organization (CCO) perspective. The book provides novel empirical findings on the change and development of business schools in particular and universities more generally. The book also offers a stimulating critique of some of the intellectual, professional and economic challenges facing business schools in the contemporary world. This entry was posted in uncategorized and tagged publication, research on 27. November 2014 by Fabian Hattke. Our research “Institutional Change of the German Higher Education System: From Professional Dominance to Managed Education” (Markus Reihlen & Ferdinand Wenzlaff) has been published as a book chapter in the Handbook on the Entrepreneurial University (Edward Elgar), edited by Alain Fayolle and Dana Redford. This entry was posted in uncategorized and tagged publication, research on 31. January 2014 by Ferdinand Wenzlaff. University Commons Article in German Journal "Hochschulmanagement"
A first outcome of our effort to develop a resource-perspective for higher education institutions got published in a special issue, edited by the commission “higher education management” in the German association of business and management professors. You can find the abstracts of the special issue here. This entry was posted in uncategorized and tagged common resources, publication, research on 30. October 2013 by Fabian Hattke. Please note that our colleague Katrin Obermeit published her review “Students’ choice of universities in Germany: structure, factors and information sources used” in the Journal of Marketing for Higher Education. Congratulations! This entry was posted in uncategorized and tagged publication, research on 28. November 2012 by Ferdinand Wenzlaff.